Florence is a very romantic city in itself, but Piazzale Michelangelo is probably one of the most romantic places in the entire world. 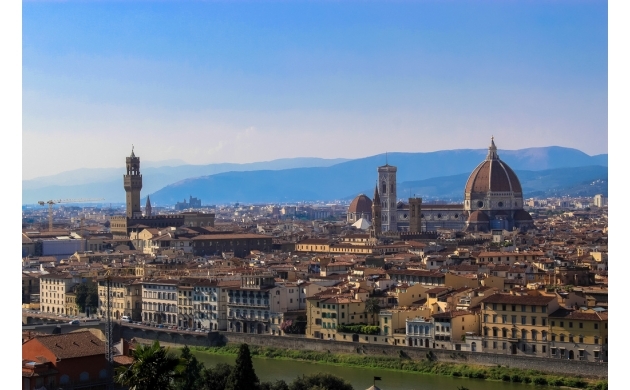 It's a place where you can enjoy the magnificent views over Florence and see the Duomo emerging from the city center, while the hills of Fiesole and Settignano rise up in the background, embracing the valley below. Over the Arno river, in the area of Florence known as Oltrarno, hidden behind the Tower of San Niccolò one finds the large Rampe del Poggi. This beautiful stone staircase, which passes by the Giardino delle Rose (Florence's splendid municipal rose garden), allows you to reach the Piazzale Michelangelo via a pleasant stroll through flowers and various other plants. 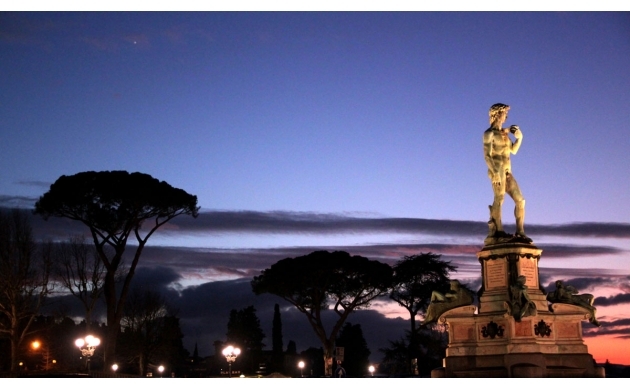 Piazzale Michelangelo was designed in 1869, a year in which Florence temporarily became the capital of Italy. The architect Giuseppe Poggi created the project with the idea of giving tribute to the great works of Michelangelo Buonarroti. The works carried out on the hill were part of a larger project called the "Risanamento" translated as "Renovation" (n.b. - different from the Renaissance), that marked the restructuring of the entire urban fabric of Florence. The new bourgeois style foresaw the remaking of the Lungarni (the streets flanking the Arno river) and the opening of the roads that circle the city center like boulevards. Meanwhile, on the hill of San Miniato, the Viale dei Colli was designed to create a long panoramic tree-lined street, 8 km in length, that would peak where the Piazzale Michelangelo was meant to rise up. This terrace, which has a truly privileged view of the city, hosts at its center a large bronze replica of the famous statue of David (the original being located in the Museo dell'Accademia), as well as replicas in bronze of the Four Allegories (the originals of which are found in the Cappelle Medicee di San Lorenzo). Poggi also designed the Loggia in a neoclassical style. This structure dominates the entire terrace and was originally designed to host a museum dedicated to Michelangelo. This idea, unfortunately, was never materialized - and today the rooms of the museum host a restaurant which has the privilege of enjoying a incredible panoramic view of the city center. 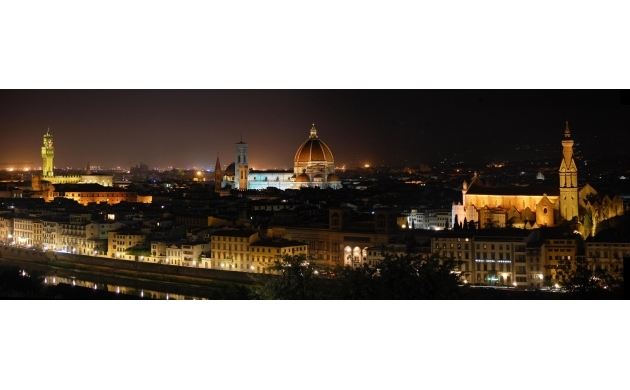 Piazzale Michelangelo is a place to visit by both day and night. For this reason we suggest you go during sunset, when you can see Florence transform from day into night. In this way you can enjoy the delightful stroll up to the Piazzale under the sun, and then admire the sunset with your sweetheart. If by chance you happen to arrive a bit early, you can always take the opportunity to visit the church of San Miniato al Monte, which is found right at the top of the Piazzale, and which is thought by many Florentines to be most beautiful church in the city.